Cinema Asia DVD Review. Its narrative provides a clear historical context as well as intelligent elucidation of the present cinematic environment of each nation, and the set as a whole proves a real treat for those whose cinematic palette extends to more worldly flavours. Taking a somewhat loose definition of the term ‘Asian,’ this nonetheless excellent SBS 5-parter takes an in-depth look at the dynamic national cinemas of China, Taiwan, Korea, India and Iran. Each episode runs just under an hour and explores recent trends in each nation’s regional cinema, some of its most successful films and directors, sociopolitical influences and likely directions for the future. Featuring interviews with local directors, actors, critics and commentators as well as liberal excerpts from the films themselves, the series comprises a meticulously crafted and highly detailed glimpse into some of the world’s largest and most exciting cinema scenes. 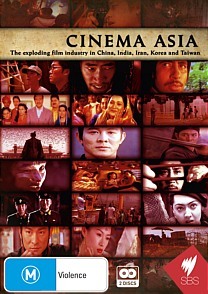 As a part time film student and full time nerd I found Cinema Asia indispensible in providing an overview of the pan-Asian film scene as a whole, with the episodes on Korea and China of particular interest given that these countries have consistently produced the best Asian films of the past decade and a half (sorry Japan). Its narrative provides a clear historical context as well as intelligent elucidation of the present cinematic environment of each nation, and the set as a whole proves a real treat for those whose cinematic palette extends to more worldly flavours.